Born in Kashiwa-City, Japan, Yuka Chokyu came to Canada in April 1989. In 1990 she was involved in a car accident that left her paralyzed and wheelchair dependent. Yuka started at Douglas in a summer ESL immersion program in 1991 and she graduated in June 1994 with a diploma in General Business, with a CGPA of 3.73. 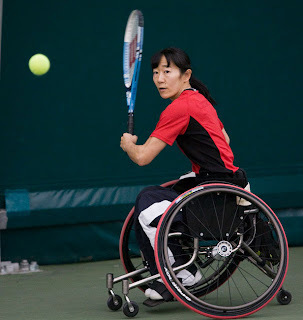 It was after her accident and subsequent stay at G.F. Strong Rehab Centre in Vancouver that Yuka discovered wheelchair tennis. She began playing at the local public courts in Dunbar and, in 1997, made Canada’s national team. Today, Yuka is the number two-ranked player in the country. Her career accomplishments to date also include winning 22 singles titles, 48 doubles titles and competing in the Beijing 2008, Athens 2004, and Sydney 2000 Paralympic Games. She has won numerous awards including Sport BC Disabled Athlete of the Year (1998) and the Premier’s Athletic Award (1996-1999). She was named Female Athlete of the Year by the BC Wheelchair Sports Association (1997 and 2001) and by the Canadian Wheelchair Sports Association (1997, 1999, and 2001). Tennis Canada named her Female Wheelchair Athlete of the Year in 2000 and 2001 and Wheelchair Athlete of the Year in 2005 and 2006.